On Saturday, November 10th, Two Beers Brewing goes to 11. It has become one of the most popular idioms in the English language. Don’t believe me? Just go to Google and type in words these go… and see what the world’s most popular search tool auto-populates for the rest of your search phrase. “These go to 11.” Yep, that’s it, the iconic words of Spinal Tap lead guitarist Nigel Tufnell. Nobody gives poor Nigel credit for saying other notable things like, “It’s a fine line between stupid and clever.” Nope, it’s all about 11. Why did the quip “These go to 11” strike such a special chord? Because when Nigel said it, he wasn’t talking about a number, he was talking about an attitude. He was talking about the relentless pursuit of one more. Oh, and in context, it was really, really funny. Eleven represents the act of exceeding the top by going one more, one louder, one better, and so one. And thus, on Saturday, November 10th, Two Beers Brewing celebrates the relentless pursuit of one more. In this case, the company’s 11th birthday. The party at the brewery’s tasting room in Seattle starts at 1:00 and goes until 7:00, with a special toast at 3:00. For this one, they’ve dug some rare gems out of the cellar, tapped into some barrels, revived some fan favorites, devised some clever infusions, and so on. The beer list (shared below) offers a trip down memory lane as well as a glimpse into the future. Beers will flow from 18 rotating taps. 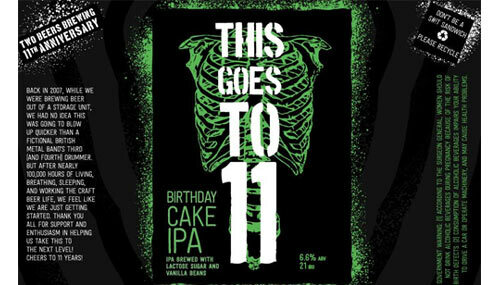 The celebration at the brewery’s tasting room in Seattle features the release of This Goes To 11 Birthday Cake IPA. Why? Because birthday cake is great, but it can be one better. Likewise, IPA is great but it can be one better. Following the party on Saturday, look for a limited number of 16-ounce cans at select local bottleshops. This Goes to 11 is a 6.6 percent ABV, 21 IBU limited release IPA brewed with lactose sugar and vanilla bean. It will be available on draft and in 4-packs of 16-ounce cans (sold in limited quantity to go). Since it’s a birthday party, they’ll also pair this “birthday cake IPA” with actual birthday cake. There will be a special toast at 3:00. Keep and eye on the company’s Facebook page for more details, including info about predicted times for the tapping of each beer. Founded in 2007 by Joel VandenBrink in a 140 square foot storage unit, Two Beers Brewing Co. has been brewing and distributing beer to the Pacific Northwest for over a decade. Dedicated to crafting delicious, creative beers with quality Northwest ingredients, Two Beers Brewing is distributed throughout Washington, Oregon, Alaska and Idaho.